Written to reflect the realities of today’s business environment, Power Mentoring is a nuts-and-bolts guide for anyone who wants to create a connection with a protégé or mentor, or to improve a current mentoring relationship. Filled with illustrative examples and candid insights from fifty of America's most successful mentors and protégés, Power Mentoring unlocks the secrets of great mentoring relationships and shows how anyone (including those who are well established in their careers, or those who are just starting out) can become a successful mentor or protégé. Based on compelling interviews from Ellen Ensher and Susan Murphy’s own research, this important resource explains what it takes to develop a “power mentoring” network consisting of a variety of mentors across a range of organizations and industries. 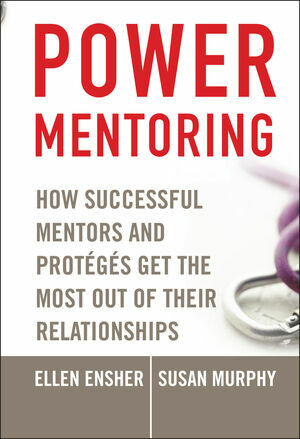 The authors provide strategies for establishing such power mentoring relationships, outline the best practices, and offer insights from mentors and protégés in a variety of fields including technology, politics, and the media. ELLEN A. ENSHER is an associate professor of management at Loyola Marymount University in Los Angeles, California. SUSAN ELAINE MURPHY is an associate professor of psychology at Claremont McKenna College and the associate dean of the Henry R. Kravis Leadership Institute in Claremont, California. The authors will donate 50% of their profits from this book to three mentoring organizations: Big Brothers Big Sisters, Covenant House, and Special Games. 1 Introduction to Power Mentoring. Who Are Our Power Mentors and Protégés? 2 The Many Faces of Power Mentoring. Classic Versus Contemporary Approaches to Mentoring. The Many Types of Power Mentoring. 3 Mentoring as a Two-Way Street: Benefits of Giving and Receiving. Give-and-Take in Power Mentoring Relationships. Road Map to This Chapter. Meet the Power Mentors and Protégés: Stories of Give-and-Take. Summary of Benefits for Protégés and Mentors. 4 The Mind of the Mentor. Mental Models: The Philosophies of Mentoring. The Mentor’s Attraction to the Protégé. 5 The Protégé’s Perspective: How to Get and Keep a Power Mentor. Developing Trust in the Mentoring Relationship. Cultivating the Art of Impression Management. 6 Unlocking the Secrets of Great Power Mentoring Relationships. Building Blocks of Effective Relationships. 7 Power Mentoring and You. 8 Conclusion: What We Have Learned About Mentoring in Today’s Work Environment. Turning Everyday Mentoring into Power Mentoring. What We Know About Effective Mentoring Relationships. What We Are Still Learning About Mentoring Relationships. The Lessons of Power Mentoring for Formal Mentoring Programs. Getting a Formal Mentoring Program Off the Ground. Appendix B: Studying Power Mentoring Relationships.